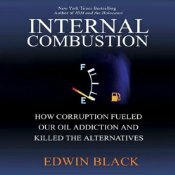 Edwin Black published his book called “Internal Combustion” back in 2006, which later was used as source material in the Documentary Film “Pump”. Internal Combustion is the compelling tale of corruption and manipulation that subjected the U.S. and the world to an oil addiction that could have been avoided, that was never necessary, and that could be ended not in 10 years, not in five years, but today. Award-winning author Edwin Black has mined scores of corporate and government archives to assemble thousands of previously uncovered and long-forgotten documents and studies bearing on this dramatic story. He traces a continuum of rapacious energy cartels and special interests dating back nearly 5,000 years, from wood to coal to oil, and then to the bicycle and electric-battery cartels of the 1890s, which created thousands of electric vehicles that plied American streets a century ago. But those noiseless and clean cars were scuttled by petroleum interests, despite the little-known efforts of Thomas Edison and Henry Ford to mass-produce electric cars powered by personal backyard energy stations. Black also documents how General Motors criminally conspired to undermine mass transit in dozens of cities and how Big Oil, Big Corn, and Big Coal have subverted synthetic fuels and other alternatives. He then brings the story full-circle to present day oil crises, global warming, and beyond. Black showcases the overlooked compressed-gas, electric, and hydrogen cars on the market today, as well as inexpensive all-function home energy units that could eliminate much oil usage. His eye-opening call for a Manhattan Project for immediate energy independence will help energize society to finally take action. Internal Combustion can change everything, not by reinventing the wheel, but by excavating it from where it was buried a century ago. ©2006 Edwin Black; 2006 Tantor Media Inc.
A Radio Interview with Edwin Black, where he talks about corporate forces that have for more than a century sabotaged the creation of alternative energies and vehicles in order to keep us dependent on oil. Internal Combustion is available in both book and audio book formats.